They say that one man's trash is another man's treasure, unless they're talking about Dan Fogelberg albums. Or Bit O Honey wrappers. Proving that one mom's trash could be your treasure: Beat Up Creations. Surprisingly not named after Ike Turner's life motto, BUC is a one-woman art-shop from a former special ed teacher, whose most impressive works are pop-culture inspired images transferred on vintage collectible porcelain plates, which her antique dealer mother was going to get rid of during a move since she had so many extras, and they didn't want to get jobs at The Cheesecake Factory. Each plate's overhauled with a toxin-free/dishwasher safe digital image, with some of the best examples including a rural farm scene overtaken by UFOs, a red-and-white checkered floral plate w/ Spock's visage in the center, and a gold-rimmed number featuring a royal wearing a paper crown, titled "Burger Queen," though Kirstie Alley'll probably have something to say about that. 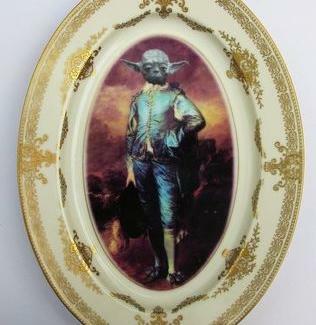 'Cause why not, there're also a slew of plates repping Star Wars, like "Galactic Empire Invasion", which features the Death Star, a TIE fighter, and a star destroyer descending on a serene riverscape, "Blue Yoda", with the Jedi master on a gold-enamel platter in full-on Napoleon pose, and another plate w/ Darth Vader rocking a suit, so clearly he's not a TIE fighter. 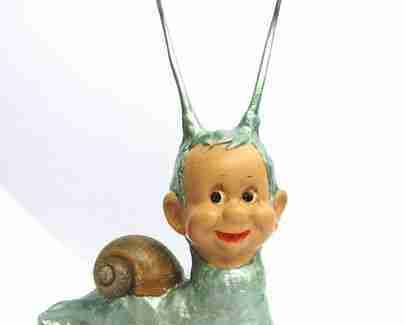 In addition, the artist also does original sculpture work, w/ examples including a dwarf-like man/snail combo, a gazelle w/ the face of a cupid doll, and the taxidermy-looking "Billy Jean The Goat" -- though it's known for eating trash, its Hard to Say what it'll do with Fogelberg.